Don't beat up on yourself, Little Hawk. At least you TRY to elevate the political discussion to a higher plane of aloof, apathetic superiority! Rap... check the drag. And oil the puppies at least thrice a year and every time you fall in the water. I know people here love to hear themselves talk, and that's okay, but the political threads are the absolute nadir of that particular propensity taken to its lowest level of negativity. Which in spite of pulling thousands of yards of cyberink, neither of us have retrieved jack from!! "Maybe they just don't feel there is anything worth retrieving on the other end." Maybe they just don't feel there is anything worth retrieving on the other end. While we're on the subject, does anyone have any idea as to why two of my spinning reels aren't retrieving? They seem to be just fine otherwise. Since its on Venus it must be the Funnel of Love. Looks like an erie canal. You've ruined it for me! Good lord!!! That must be about the biggest funnel cloud around. Not a place you'd want to go cruising around in, I wouldn't think. One of which is "How did it get so big?" 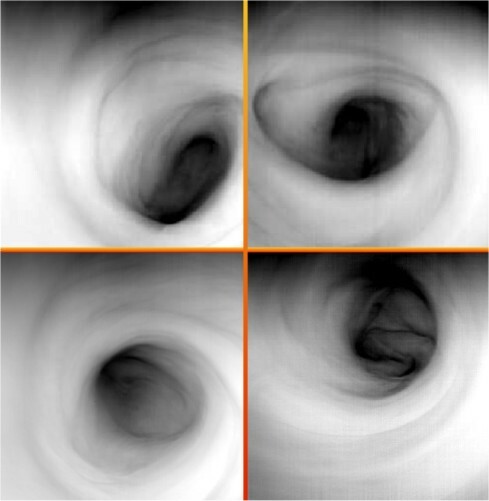 Here are four interesting photos of the "vortex at the South Pole of Venus." They look very much like black-and-white photos from my last colonoscopy. This raises many disturbing questions. "It came from under...the...beeeeddddd...." (cue:thunder, lightning, sound of window blinds rattling in breeze) (pan to open window, blinds rattling, darkness outside, eery wind sounds). "Who was it? Where did it realy come from? More important....who made it????? That's your project, Amos! The Night of the Living Dust. Someone left you something to remember them by. As Christine Lavin said, "If it weren't for the dust bunnies, I wouldn't have any pets at all!" I'd like to see that knit-up person, though. Filmed in slow-mo it would be a great horror flick thing. Well, I suppose it is a comfort to know that no matter how long I have to be away, I can depend on walking into MOM's place and know it will be familiar. I think you should be downright ashamed for painting such awful pictures of that nice mister Gore. Anyway, keep up your bragging, amigo. The hot air fills my sails. My Gore, sir, will flatten your Bush before the Supreme Court of Mom. I shall flatten your pouw, and make a football of your rowdy-dow-dow.